DBP is a man-made chemical listed as a 'teratogen'. A teratogen is anything that can cause birth defects, pregnancy complications or loss of pregnancy. It is used to make PVC, adhesive glues and printing inks. Toluene is a flammable solvent which is petroleum-based produced in the process of making petrol. Toluene has been linked to cancer, and can effect the nervous system producing symptoms such as tiredness, weakness and memory loss. It can also cause skin irritation. Toluene is commonly used to manufacture polymer plastics. Formaldehyde is a colour-less, flammable and extremely strong smelling chemical. Simply inhaling the fumes can result in watery eyes, headaches, burning in the throat, and breathing problems. It may cause allergic reactions and is unsafe for use by asthmatic people, when tested on animals it causes cancer in the nose and throat. It is commonly used in industrial strength glues, adhesives and disinfectants. This is enough to put you off using Nail Polish altogether isn't it?! 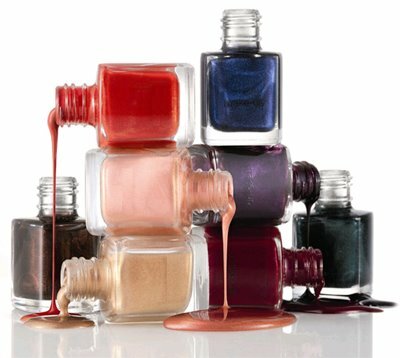 Nail Polish makers have been under pressure for a number of years to reduce or eliminate toxic ingredients and many nail polish brands have become free of DBP, Toluene, Formaldehyde. Do you always check that Nail Polish is 3 free? To be honest, I sometimes think about it. But then, I've invested in a good base which I ALWAYS use before applying any nail polish. For me, it's important to have natural cosmetics and also these, which were not tested on animals. I've honestly not really given it too much thought if I'm honest with you! I just kinda figured if things were really *that* bad then they wouldn't be allowed to put them out there nowadays. Something to think about, eh. I always check nail polishes I want to buy are 3 free. I have even gone through old polishes and as much as it pained me (I have a few favourites) but I threw them all in the bin, its not safe to have old polishes from years ago (even though shelf-life) lasted much longer. Thanks for that informative post! I'm always amazed and kinda worried when I read what substances are allowed in cosmetics o_O Still I have to admit I love to paint my nails and don't worry too much about hazardous chemicals. I can only recommend the Book Toxic Beauty by S. Epstein on that topic!